- We tailor our services to our customers’ requirements and expectations, regardless of the industry, explains Hermen Nassette, Managing Director of the company Van de Steeg in the Dutch city of Enschede. This is very clear from the company’s history: established in 1931, Van de Steeg started as a service provider for the textile industry. After its decline, the company focused on media printing. Together with the record label Polydor, the printing of album covers became a core business. With the introduction of CDs, Digipak media packaging was introduced and produced for major companies like Sony, Warner, and EMI. As this market diminished in the age of streaming services, Van de Steeg experienced strong growth in the cosmetics market. 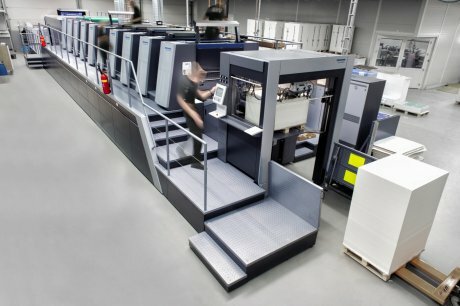 - We had a Heidelberg Speedmaster XL 105 in the Thalgau plant in Austria, and were very impressed with its quality and above all the short makeready times, reports Nassette. - Heidelberg has been looking after us as a global account for more than ten years, and recommended exactly the right press for our new requirements – a Speedmaster XL 106 with six colors and double coating unit. The Speedmaster XL 106 has been in operation in Enschede since the beginning of this year, replacing two competitor presses. Van de Steeg is now specializing in solid cardboard, finishing effects, and luxury packagings. With an average run length of 3,500 sheets per order and lots of job changes during three-shift operation, makeready time is an important subject. This is where the “Hycolor Multidrive” inking units and its parallel processes come in, greatly shortening makeready times. The inking and dampening units can operate independently from the main drive, which means that the inking units can be washed while the printing plates are changed via the main drive or rubber blankets and impression cylinders are washed. With the Prinect Image Control 3 color measurement system, opaque white can be measured and even controlled. This enables process control and color constancy on transparent or metalized substrates, as are frequently found in luxury packagings. - Makeready is now quick and the print quality as well as the reliability of the press are first class, says Nassette with satisfaction. - This press offers absolute added value and we have received exactly the right machine thanks to the comprehensive consultation. Since the Speedmaster XL 106 is the only press in the press room, its high availability is guaranteed by a 36Plus service agreement. The press can be used for both UV and conventional printing, which delivers very high flexibility. Today, high-end packagings make up around 70 percent of Van de Steen’s business, while media printing accounts for 30 percent, marking a complete reversal. Its core business consists of developing and producing luxury packaging solutions from solid and folding cardboard – from design to completion – for the retail trade. High-quality finishing effects ensure eye-catching packagings at the point of sale. The double coating unit of the Speedmaster XL 106 permits a wide choice of variants here– matt and gloss effects, UV coating, dispersion and drip-off coatings. The topic of sustainability and reduction of plastic consumption is extremely important in the area of high-end cosmetics. Environmentally friendly packagings made from cardboard and soy- or water-based coatings are very well received here. - For high-end packagings in the luxury segment, it is the creativity that counts, not the price only, explains Nassette. - We will continue to tap this growth market and with the new printing press are very well positioned for this.